Hanging Sign Post - - designed for use with your own address plaque and 4x4 wood posts. Made in USA. Installs over your own wood posts. 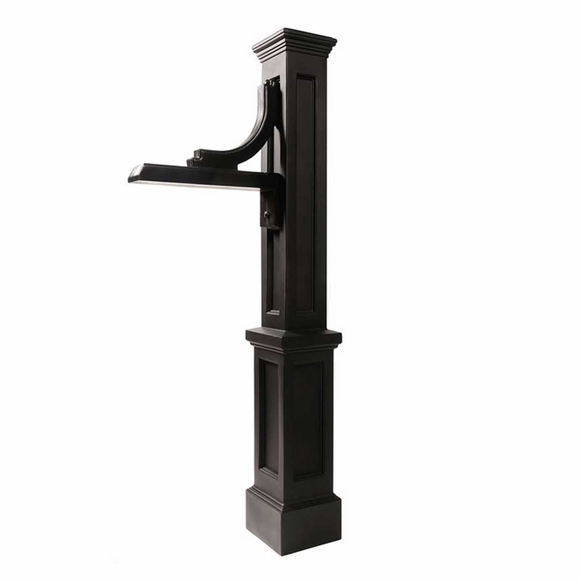 Includes decorative post and support arm. Note: 4�4 wood posts, address plaque, and plaque mounting hardware NOT included. Will accommodate hanging plaques up to 15 inches wide x 12 inches high. Post is rotationally molded using linear low density polyethylene (LLDPE). This material is virtually maintenance free, extremely durable, and will provide you with years of worry free enjoyment. Installs easily over standard 4�4 wood inserts (not included). Low-maintenance plastic won�t fade or yellow. The colorant is added throughout the material so the finish is consistent inside and out. No painting or staining required. Note: 4�4 wood posts, address plaque, and plaque mounting hardware are NOT included. Dimensions: 8"W x 22.25"D x 56.5"H.
If you are purchasing an optional sign, please allow 2 to 3 weeks for delivery. Hanging Sign Post designed for use with your own address plaque and posts. Ground mount address system installs easily over standard 4�4 wood inserts.